A parliamentary report of 1777 recorded parish workhouses in operation at Barnardiston (for up to 30 inmates), Clare (30), Derediston (10), Haverhill (40), Hundon (20), Stoke [by Clare] (23), Stradishall (16), Wickhambrook (42), and Bumpstead Steeple (25). Haverhill's workhouse stood on the site of the present Queens Square. 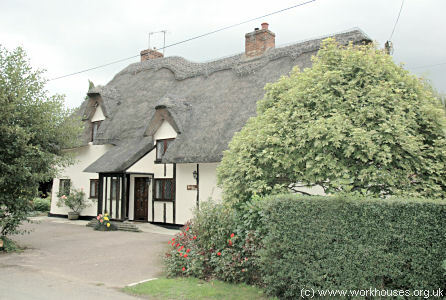 Wickhambrook had a workhouse at Attleton Green, later converted two two cottages, and now a single residence. County of Suffolk: Barnardiston, Great Bradley, Little Bradley, Clare (2), Cowling, Denerdiston or Denston, Haverhill (2), Hundon, Kedington, Poslingford with Chipley, Stansfield, Stoke by Clare, Stradishall, Great Thurlow, Little Thurlow, Whixoe, Wickhambrook, Withersfield, Great Wratting, Little Wratting. County of Essex: Ashen, Birdbrook, Helion's Bumpstead, Ovington, Steeple Bumpstead, Sturmer. The population falling within the Union at the 1831 census had been 16,192 with parishes ranging in size from Little Bradley (population 22) to Haverhill (1,758). The average annual poor-rate expenditure for the period 1833-35 had been £14,315 or 17s.8d. per head of the population. In 1836, the new Risbridge Union took over the existing parish workhouse at Haverhill and the sum of £800 was spent on its enlargement. In 1856, a new building was erected at Kedington to designs by JF Clark. Its construction was reported in the Illustrated London News in April, 1859. This building has been lately erected at Kedington, in the county of Suffolk, from the designs of Mr. J. F. Clark, of Newmarket. It is Elizabethan in character, and, from the admixture of red and white in its frontages, presents a very cheerful appearance. The building will contain upwards of six hundred paupers, exclusive of a spacious infirmary for the sick. The total length of the frontage is 366 feet, the centre of which is appropriated to the board-room, guardians' offices, and receiving-wards; the remainder of the frontage is given to the aged and infirm, and the children, who have covered arcades and grounds for exercise inclosed by palisading. The master's residence is placed in the centre, whence he has communication with all the wards by corridors, after the model-prison system. The comfort of the old and young has been particularly studied, and the general classification is admirably arranged. Risbridge workhouse from the south-east, 1859. The workhouse was extended in 1900 with the addition of a new male block and kitchen. Its location and layout are shown on the 1920s map below, by which time the workhouse was officially known as Risbridge Poor Law Institution. 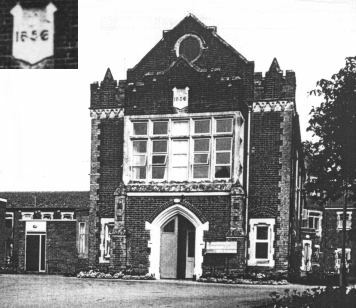 Risbridge entrance block from the south-east, 1980s. 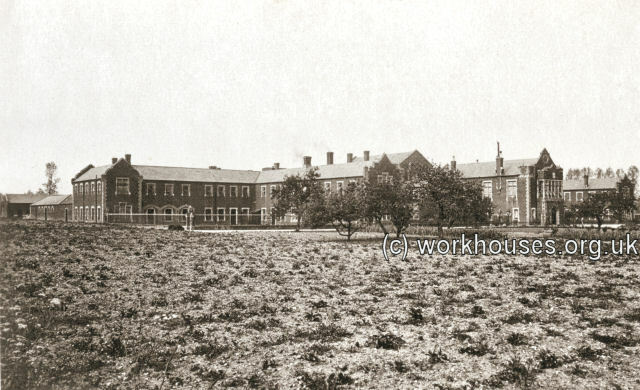 Risbridge workhouse from the south, c.1905. A housing estate and geriatric care home now occupy the former workhouse site. Suffolk Record Office, 77 Raingate Street, Bury St Edmunds IP33 2AR. Holdings include: Guardians' minute books (1894-1930); Births and deaths (1913-37); Creed registers (1901-37); etc. Illustrated London News , April 2nd, 1859.